The Vital Signs 300 patient monitor is excellently suited for routine monitoring of vital signs during small surgical procedures. The patient monitor is light, has intuitive controls and can, of course, be used as a mobile device. 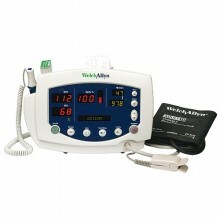 Click the button below to add the Welch Allyn Vital Signs 300 Patient Monitor to your wish list.